Hydrea London Japanese Spa Sisal Exfoliating Back Strap is made of 100% natural Sisal fibre that makes for a truly invigorating scrubbing experience. It exfoliates and massages the skin, leaving it healthy and glowing while also making you feel refreshed. Perfect for those hard to reach areas like the back and shoulders and is great for improving skin tone and condition. For best results use regularly. Perfect for use in the bath or shower with your favourite cleansing product. After every use rinse well and gently squeeze out all excess water, then allow to dry naturally. Do not bleach, boil, machine wash.
Below are reviews of Japanese Spa Sisal Exfoliating Back Strap by bodykind customers. If you have tried this product we'd love to hear what you think so please leave a review. 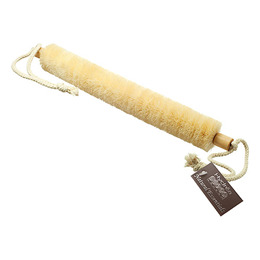 Hydrea London Japanese Spa Sisal Exfoliating Back Strap is made of 100% natural Sisal fibre that makes for a truly invigorating scrubbing experience that exfoliates and massages the skin, leaving it healthy and glowing.